Stein describes this Clay figure of man rider as, “Head and body moulded on pointed stick core, which passed below into hole in back of horse, fixing rider upright in saddle. Legs moulded without core in convex curve, flat on inside, to grip sides of horse, but now broken from body. Arms (so far as preserved) straight by side, but broken off above elbow. Dressed in tight-fitting vermilion coat reaching to knee and black top-boots edged with white. Skirts of coat sprinkled with spot rosettes in brown. Hair short, black. Cap close fitting, red at lower part in front, passing into narrow red band at back above lower edge of cap, which is of the high-lobed crown type, with red bow in front. Lobe is cleft in front. Face painted pink, with black for eyes, eyebrows, moustache, and small beard ; crimson on lips. Features rather perfunctory. Head broken from body, and general condition somewhat worn. Height 10¼". Stein’s detailed description follows as “Clay Figure of man rider, arms lost from above elbow and legs broken from body. Coat pale yellow ; boots or shoes black ; leggings from ankle to knee white with dot and circle decoration in black. Black stirrup-leather passing down front of legs, and pale yellow stirrup. Vermilion bow and band round cap ; but vermilion band down to lower edge of cap at back. Fair condition. Height 10½". Fig. 26. 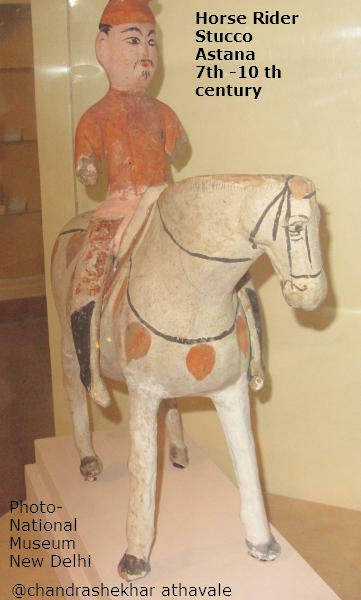 Clay figure of rider from Astāna cemetry, eastern Turkestan. 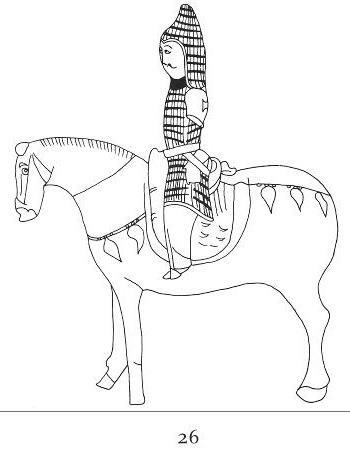 According to the Byzantine Emperor Leo VI the nomad Turks were equipped with cuirass, sword lance and bow, the horses of their leaders wearing iron or leather armour (figs. 26-27). Back to Tarim Basin Frescos etc.